By Jordyn Grzelewski | January 6, 2019 at 12:06a.m. Thinking of advanced manufacturing, one might picture the technology’s use in medicine or industry. But a less-discussed facet of 3D printing is its potential in the arts world. One local company is leading the way to applying this technology in new and creative ways. After a group of local entrepreneurs founded Freshmade 3D in 2015, the Youngstown Business Incubator portfolio company made a name for itself when it was commissioned to design and create life-size, 3D-printed bobbleheads of then-presidential contenders Donald Trump and Hillary Clinton. The Trump bobblehead, weighing in at more than 250 pounds, was on display outside the Republican National Convention in Cleveland in July 2016, and both bobbleheads were displayed at a presidential debate later that year. That project was an important one for the local start-up, which used the buzz and revenue it generated to position itself for a future pushing 3D-printing processes forward. Wetzel, who started his career working in additive manufacturing at YBI, founded Freshmade 3D with Brett Conner, a Youngstown State University professor who directs the school’s Advanced Manufacturing Research Center, and Christopher Tomko, an industrial design and manufacturing professional who leads Freshmade’s design work. While working on the bobblehead project, the Freshmade team found that current 3D-printing processes were not feasible for the endeavor. So, they created a new one. Working with Humtown Products in Columbiana, where it does its printing, Freshmade developed AMClad, a 3D-printed sand composite material. The Freshmade 3D team describes AMClad as a durable material that is stronger and more cost-effective than others. It is versatile, too, as you can apply a wide variety of finishes to it, from metal plating to paint to a “fine grit” surface. Freshmade 3D officially launched AMClad last year, and marked the occasion with a bowling party featuring a bowling ball made using AMClad. After the bobblehead project put Freshmade on the map in 2016, the team saw the potential to expand its use of AMClad. “That brings us to where we are today. The common theme in the work we’ve done is the artistic aspect,” Wetzel said. A recent project, for example, had Freshmade 3D working for a library in Tennessee that commissioned the company to create literary-themed artifacts. Tomko designed enlarged book spines from J.R.R. Tolkien’s “Lord of the Rings” series. The team even created a gigantic replica of the “One Ring” from the book series. This is just the start of some ambitious plans the start-up has for applying its technology to the arts. The team is looking at collaborating with a university to create replicas of famous statues for art and design students to study; working with museums to print art for people who are visually impaired; and working on large-scale architecture projects. Freshmade could, for example, design and print elements of a building. “That’s definitely where we want to take this. That’s really where the value is,” Wetzel said. “It fits right in with our capabilities to be able to handle and process artwork, too,” Tomko added. Freshmade’s capabilities go beyond 3D printing. 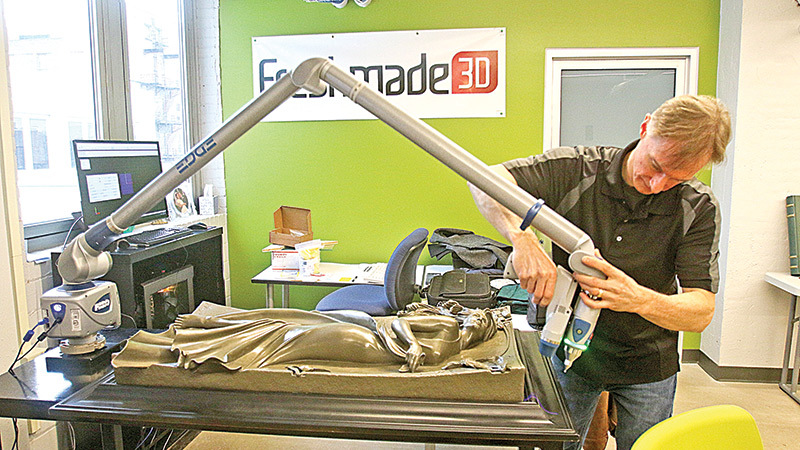 Tomko handles the design work on projects; Freshmade has a digital scanner that can be used for high-precision scanning; and the team can make and install the parts, too. They are exploring ideas such as turning photos into 3D likenesses, which could be used to replicate famous artwork, for example. “There’s a need for this. If museums are making exhibits for visually-impaired people, there needs to be art,” Tomko said. “You rarely hear about the artistic side of it and how it can make museums more accessible,” Wetzel added. They also see their use of this technology as something that will be helpful to artists. September 27, 2017 12:03 a.m.
June 17, 2016 12:09 a.m.